Available at RC Willey, choose the black Weber Q 1200 liquid propane portable grill when you want to grill on the go or just need a little something to cook on without firing up the entire grill. Travel on or off the beaten path, camp in the woods or near the shore. Explore the world with big taste and your Q 1200 portable gas grill by your side. Throw on a few hot dogs, some burgers, or grill some summer fresh veggies. Don't let the size of this grill fool you! Small enough to fit on a city balcony yet large enough to execute an entire meal. Convenient side tables make it easy to keep all of your spices, marinades, and tools right where you need them. Weber Q 1200 Liquid Propane Portable Grill Black is rated 4.7 out of 5 by 757. Rated 5 out of 5 by BGDAWG Light & Compact Bought this last year. We took a road trip staying at KOA cabins. We cooked all our meals on this little beast and it perform better than expected. Rated 5 out of 5 by Gordo99 Designed well! I bought this grill last summer with the intention to use it on vacation road trips. I like it so much that I plan to use as my everyday barbeque! Rated 4 out of 5 by Hutter Great quality but sticky grill Perfect size for us as campers. Quality of unit is good. The only negative is the grill does not have the same characteristics as my larger Weber grill we use at home. I like to sear on higher heat and the turn down the heat to finish cooking. I cannot find a way to prevent meat from sticking to the grill whether I oil the meat or the grill first. Any suggestions would be appreciated. Rated 4 out of 5 by John hk Simple to use Easy set-up, easy to use and pretty easy to keep clean. Easily handles a dozen burgers and seems to cook quite evenly. Rated 5 out of 5 by Marilyn Love the Color This is the best barbeque we have ever had. It grills to perfection with no hot spots. If for some reason it calves we will immediately buy another one. Love the choice of colors as well. Rated 5 out of 5 by Wild hair 22 The portable BBQ out there I got this great little unit for my Birthday last year. Best gift ever! It works like a charm...good even heat...easy to clean. I absolutely love it! Rated 5 out of 5 by Moleman14 Great quality I was looking for a good quality bbq for our pontoon boat and the Weber bbq fit the order. Rated 5 out of 5 by Yaseen Great Grill I bought this item a year ago and I am very happy that I did. Rated 5 out of 5 by EddyCalgary Great BBQ for Rc Did our research. Saw these had high reviews. Bought one for ourselves for our Rv. Excellent BBQ. Added extended line and adapter so we can plug directly into RV propane! Rated 5 out of 5 by Bison716 Amazing performance for a portable BBQ I've used several different brands of portable BBQ's over the years, but this Weber Q1200 is by far the best. The shape of burner creates very even heat, and it doesn't blow out on a windy day. Construction is sturdy, and overall I am very please with it. Rated 5 out of 5 by Norm53 Great Q When we bought this unit we had our reservations as to the overall usefulness of a small BBQ, but it performs very well with good temp control, we have used this unit in many of our travels and would recommend it to anyone looking for a smaller BBQ. Rated 5 out of 5 by Anonymous Perfect portable BBQ I've owned the Weber Q 1200 for over 2 years now and I have absolutely no issues with it. It is the perfect portable grill in my opinion. I've never been happier when trying to cook for a large group or just my family. Very easy to use and when combined with the stand, it can easily be rolled to your destination! Rated 5 out of 5 by ladycath. Fonctionnel, coloré et d'accès facile Nous sommes ravis de notre achat. Et avons apprécié le service lors de la réparation du régulateur. Rated 5 out of 5 by VCR1 Super BBQ The Weber 1200 BBQ is the ideal BBQ for especially young to senior couples in a home, apartment, condo, on the deck or balcony, and its light easy to maintain, a joy to use, store, the folding stand should be bought, but it does not have to be, just makes it easier to put away off season or back bout, but its light and still strong. No large gas containers and no hassle. Since buying mine, three neighbors have got the same and all love them. For a family wanting a larger unit that is simply a upgrade to the larger model, but its fast so the 1200 is more than adequate. Why have the rusting hassle of a large, heavy, piece of equipment. Who is impressed more with this - your stomach, taste buds, and all who see it used, or a half ton of shinny recycled metal to rust and create work versus pleasure. Bigger is not always better, this is proof of that to a T.
Rated 5 out of 5 by Penticost Best little bbq Perfectly cooks all my grilling meats and the size is perfect for my condo and camping! Love it! Rated 4 out of 5 by Bolobob Solid BBQ Good portable BBQ. Nice side trays. Good constant heat levels. Compact and very easy to lite. Grill is hard to clean even with proper cleaning products. Rated 5 out of 5 by SuperGM Fonctionne très bien Nous avons acheté notre Weber l’été dernier, nous en sommes très satisfaits, prend peu d’espace et répond très bien à nos besoins. Rated 5 out of 5 by Arrbee It’s a Weber, only smaller! We bought the Weber 1200 for our trailer. 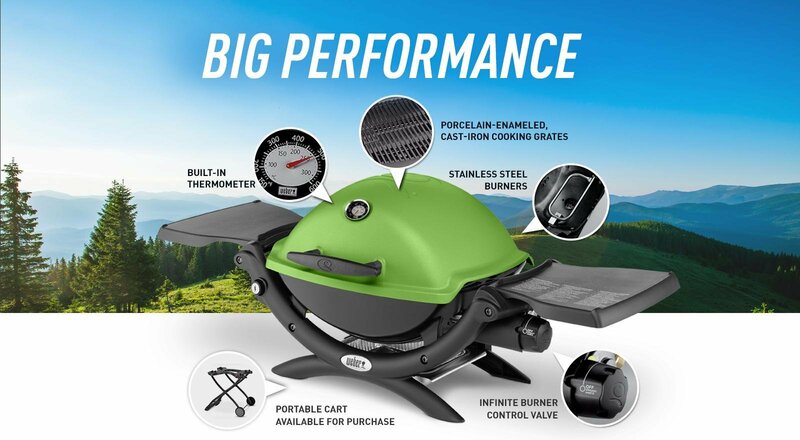 It performs like our full size grill at home, even heat and is solid. I love how it folds up, making it compact for travel. After using it it comes apart easily to clean which makes it convenient for strange between camping trips. I have nothing but praise for this little bbq. I would buy it again. Rated 5 out of 5 by Yush The Perfect Personal Grill My wife and I live in an apartment that does not have gas. We keep this grill in our balcony so we can add some variety to our cooking. This grill does not disappoint. We used it to grill vegetables, steaks, whole fish...etc. Everything turns out perfect every time. Note: We always grill with grilling mat. Rated 5 out of 5 by tnislandtimer Little Grill, BIG performer!! The fact that this is a tabletop grill and small propane fueled is in no way meaning it's only for 4 hamburgers or some hot dogs...This grill out performs full size grills I've had and makes you wonder why you really need a full size in the first place! I've grilled steaks, a pork loin and a few other 3 to 4 times for a family of 4 before having to replace the fuel bottle.Because of it's ease and performance, I'm now able to grill at least a couple times a week, Winter included. Great product and food tastes Great!!! Rated 5 out of 5 by edsobe Great Features Happy w 1200 Gas Grill, very happy w it, Mostly happy. Rated 5 out of 5 by Ice life Weber Q! Took this little "Q" on I ice fishing trip to Lake of the woods Mn. It was negative 30 degrees outside! This grill never missed a beat! It worked flawlessly! Other brands that made the trip that weekend wouldn't stay lit I'm very impressed! Rated 5 out of 5 by Freakstick Outstanding Bought this grill almost three weeks ago and just loving it. Rated 5 out of 5 by Br549 Best grill on the market for its size! Bought this grill 3 years ago and use it about 3 times a week and its still going strong still on the original burner an amazing little grill would purchase this again 100 times over and will if i ever wear it out ! Rated 5 out of 5 by StarboardTack Love My Q1200 I use a large charcoal grill most of the time, but I almost never grilled during the rainy Seattle winter (and fall and spring). Finally, I decided to buy a small gas grill for use in the shelter of my small back porch. I'm so glad I found the Weber Q1200. It fits nicely on my porch and will move out to the patio when the rain ends. Even now, during the rare snowstorm, I'm able to grill under cover. I've grilled asparagus, steaks, fish, chicken and burgers, all to perfection. Tonight I even grilled the corn tortillas for fish tacos. I have no complaints after almost 10 weeks, grilling a few times each week. The shelves are handy, and the electronic ignition is flawless. One reminder, though, to brush off the top of the burner after you've brushed the grates, since the burner has no drip cover protecting it from the falling debris. I've also followed the recommendation from others and have lined my drip pan with aluminum foil, allowing it to be used indefinitely. One thing that Weber should really make clear on the website is that the grill cannot accommodate the Coleman camping propane canisters, as they're too large in diameter to fit between the grill body and the connector. However, I've also bought the adapter hose and use a large propane tank instead of the small canisters, which I'll only use when grilling in the park. Rated 5 out of 5 by DaveH Not my first Q I have had the original Q 2000 for over 10 years. Have replaced regulator and burner once and it still works great. Family bought me a new Q100 for Christmas because it was hard to store the bigger one in our RV. The new one is Great! Can't wait to take it on our winter snowbird trip. Rated 5 out of 5 by Meat burner Meets our present needs perfectly I bought the Q1200 recently for home use as well as for camping trips due to it's size and portability. So far have only used it a few times winter does slow down outdoor cooking slightly but so far really happy with the grill. Rated 5 out of 5 by Falcon70 Excellent Grill This is my second Weber Q (i needed to downsize). I use this 2-3 times per week. I have never been disappointed. Holds the heat well, even distribution of heat, handles indirect very good too. I live in an RV and this is definitely the one to get. PS. Get the model with the thermometer in the cover, a very good feature. Rated 5 out of 5 by Mfp133 My favorite grill Been wanting to get one of these little Weber Q for a long time. So glad I finally did it. It heats up quickly, and cooks with even heat all across the grill surface. The grids are easy to clean and I really like the removable drip pan feature at the bottom. Very well thought out design. Happy Customer! Rated 5 out of 5 by Ladd Even cooking, low fuel for the heat and simplicity I'm solo that occasionally has 1 or 2 people over. I was looking for a simple, well-constructed grill that cooks evenly. I also like its heavy grill since I"'ve gone through many grills previously. Seems by the construction these will be used for many many years. Rated 5 out of 5 by Smitty1960 Super easy grilling Love the mobility of the Weber Q, second one. Original Q I bought (first gas grill) in 2005 ,hurricane Wilma, helped making coffee and food during aftermath, took to beach alot. Bought the smaller Q this last fall in black with thermometer in lid and electronic ignition . Weber is my go to all the way around ! Rated 4 out of 5 by Ginny34 Perfect for Camping We keep this grill in our camper and it is perfect!! We use it all the time. Rated 5 out of 5 by Sweetheart Great Grill Cooks as advertised. Nice design. Useful cooking and cleaning instructions. Rated 2 out of 5 by Momm Weber should make clear... Weber should make it clear that the gas canisters for this grill are not recyclable and more importantly, hard to find. You have to take empty canisters to a metal recycling center. I’ve called 3 places already to find replacements and no one has them. Rated 5 out of 5 by Rangerric Great features Bought for RV but decided to use at home. GREAT!!! Rated 5 out of 5 by Tom37 Perfect fro condo Bought this for our condo and love it! Small but meets all our needs. Heats up quickly and is as good as our big one. Rated 5 out of 5 by Bevena Perfect size for me!! Recently relocated and missed a grill-Christmas gift from my daughters! Love the convenience of the small propane canisters and the ease of starting with one click!! Rated 1 out of 5 by Mawmaw so easy to use My son who is a great griller gave it to me for Christmas. Rated 5 out of 5 by Janice8 sturdy I love this grill. very portable and sturdy. still plenty of grilling room for a portable grill. grates are nice and solid and won't rot away after a short period of time. Rated 5 out of 5 by Fran43 Easy To Use! I enjoy using my Weber grille. It’s easy to use and having a thermometer makes grilling even easier. Rated 5 out of 5 by RVcustomer Worth the Money I’ve owned many portable bbq’s in the past many that last one season or less. This Weber Q 1200 by far is the best one for the price. So easy to use and clean up afterwards. Rated 5 out of 5 by Anonymous Convenient - Easy to use/clean - we love our Weber My husband bought this for me. I am an avid outdoor kinda woman who loves to grill practically everything. This Weber is the perfect size and weight. Rated 5 out of 5 by Jaymck Simple setup, cooks effectively I bought this to go along with my Weber charcoal unit. It cooks nicely but make sure to heat the grill first per the instructions. Perfect for things like burgers, sausage and chicken parts. Easy to light & clean up. Rated 5 out of 5 by vickie 355 great features and perfect size i bought this grill years ago and I love it. I saw a good sale on another one and I gave my old one to my son and bought another. Now he loves it too. Rated 4 out of 5 by Sue349 Great Grill Have been impressed with this Grill. The quality of the food coming out has been excellent. Heat control not quite established yet, but getting there. Rated 5 out of 5 by gryffinclaw Easy for Grilling Newbies to Make Delicious Meals! If you're in the market for a grill that's easy to transport and delivers smoky meats, fish, and veggies, look no further. The Weber Q1200 is easy for this grilling newbie to operate—and bonus, the handy cooking guide included with the grill makes it easy to figure out cooking time and temperature for almost anything you want to make. I've had a blast cooking on this thing (in the winter, no less!) and can't wait to take it on the road with me. Handy tip: makes the best sweet potatoes I've ever had! Rated 4 out of 5 by Travel & cooking Great heat control & cooking area. Bought for the summer camping season so I have only used once in the cold winter air. The grill heated up quickly and the control responded well to reduce or increase the flame. The cooking area is the right size for cooking for 2 - 4 people. Lighter in weight, so easy to move & travel with. The propane attachment is very close to the handle and a "fat" propane tank was tricky to install (need more practice) and rubs against the handle. I wonder if this will wear the handle over time. The side tables fold in over the grill and I may have to protect the table from grease while on the trips. Rated 5 out of 5 by Sandi Sue Easy to use The size is perfect for a small family and so easy to use. The grates clean very easily. it was a Christmas gift. Rated 4 out of 5 by Horse camper Portable easy to use Received this for Christmas. Absolutely love it. I am an older female and cannot attach the canister. My husband even has a difficult time. Will need to buy an adapter and try that. Rated 5 out of 5 by RonnieGR Compact to bring to FL Well satisfied. I am happy with it as much as my 310 back in MI. Bought 1200 to bring to FL for the winter. Dogs, burgers and steaks so far and all cooked well. Rated 5 out of 5 by Dona22 Convenient and works well Love this grill. We are RV’ers and this is a perfect size for us. Ignites easily and heats fast. Bought this Weber because we have a large Weber at home and use it a lot. I really like the grates, easy to clean and not flimsy. Would definitely buy this again but hopefully the need will not arise. Rated 2 out of 5 by Yosef Lid issue I don't like that the cover lid doesn't have a stop on it. All the other portable grills we have had a stop on them so the top will stay up when open.its a little difficult to hold cover when loading or turning the food. Rated 4 out of 5 by ekul Great Grill for the Price This is the perfect grill if your looking for a small portable grill to take with you. It provides plenty of grill space while still being light and portable. The only issue I have is the grease trap. The wind can easily blow it away, making a mess. Other than than that small issue, it is a great grill. Rated 4 out of 5 by harkintj Meets Expectations Received this unit for X-mas as an alternative to firing up my Weber Spirit 3 burner grill for preparing meals for just a couple of people; overall, it is serving this purpose. 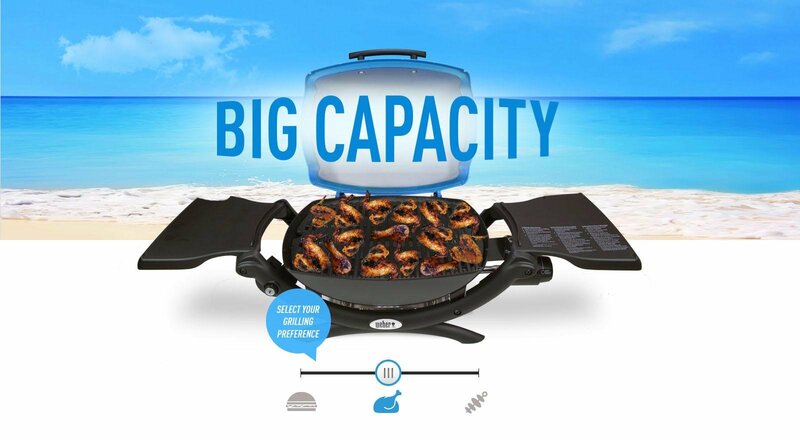 Pros: Ignites instantly, uses less propane, good construction and materials, Weber quality. Cons: No "factory" provision for adjusting fuel/air ratio for grilling at higher (Colorado) elevation, so hard to get the grill to 500 degree temperature; low(est) temperature setting still too hot to slow cook items such as ribs without burning; folding side tables, while well designed, more of a nuisance than providing utility. I ended up removing them; should have asked for the Q1000 model instead. Rated 5 out of 5 by Montanagram Love this little grill! I have enjoyed having the simplicity of this grill. I also love that it is purple. It cooks my steaks perfectly, and is easy to clean. Great product! Rated 5 out of 5 by Jr. John Convenient and compact We were looking for a grill that was easy to set up, easy to light and big enough to cook for 4 on and we found it in this Weber Q. It is an awesome little grill that does not take up much space, is portable, heats up quick and does the job quite well. It comes with aluminum drip pans to catch the drippings and the only thing I don't like is that the pans just slide in with no real way to secure them. If it is real windy they tend to want to blow away, so for now i'm using a clothes pin to hold it in place on windy days. Rated 5 out of 5 by R Lackey Great grill! We bought this looking for a grill to take in our camper. Fantastic little grill! Rated 5 out of 5 by SW WA BBQ Like the added functionality! Nice enhancements over the last Q I owned. Like the thermometer, folding shelves, and electronic ignition. The prior one lasted many years and cooked wonderfully. Rated 5 out of 5 by Abbey Great Grill I bought this grill three months ago and it is outstanding. I bought it replace an older Q1000. I like the electric start and the grates are easy to clean. Rated 5 out of 5 by Debbie A Perfect size All I can say is that I love my Weber grills. We have one for home and now one for camping. Rated 5 out of 5 by Annabella GREAT product! We are retired so there's usually just the two of us and I wanted a small but durable grill that I could handle by myself (female) for getting it in and out of the porch when we grill outside. This grill is absolutely perfect for me and so easy to clean up. I love, love, love it!!! The grilling surface is larger than you think. It handles a lot. Very pleased, as always with Weber products. Rated 5 out of 5 by Lily G Compact and great Best grill I’ve bought in a long time. It’s compact but you can definitely grill a good amount of food on it. I would highly recommend it!! Rated 5 out of 5 by Darrell on the creek Great Grill My wife and I love this grill. We bought it for using with our Travel Trailer but it cooks so well that we use it in place of our larger grill on our deck. I think the size keeps the temperature more accurate and consistent so our food grills perfectly. Rated 5 out of 5 by Rick413 Nice RV and Home Grill I purchased this grill a few months ago for RV travel use. Unfortunatly I have been unable to travel, but I’ve used it at home on a number of occasions. It does a great job and it’s such a nice size for bbq’ing for my wife and I that I have since purchased the portable stand for the grill as well. I’m very pleased with both items and would definitely recommend them to anyone else looking for a grill this size. Rated 5 out of 5 by Scorch Easy to use and bbq is quick and easy We just hooked it up to a bigger tank. Easy and quick for just the 2 of us. So glad we bought it on sale at the end of summer for camping and now for home use too! Rated 5 out of 5 by Cyndi66 LOVE IT Won this at our Office Christmas Party. Have used it a couple of times and I Love it!!! Rated 5 out of 5 by MikeB3506 Great compact size with capacity. I bought this grill 2 months ago. We have used it to prepare hamburgers, steak, salmon, shrimp and chicken. It takes about 10 minutes to get hot around 500 degrees. It easily maintains the needed temperature for cooking. It can cook 8 burgers, several ribeyes and a 8 pieces of chicken. It is very compact and it folding abilities make it easy to take along. Great for RV use or using on our deck. Rated 5 out of 5 by Tjpm Powerhouse grill in a small package Took this new ,untested grill to a Christmas party for grilling steaks. I admittedly was a bit apprehensive if this small grill had the stuff for getting the steaks done right. I have no doubts any more. The 5 large strip steaks came out perfect. Rated 4 out of 5 by daveof5 Great Grill I really like this grill. It is sturdy and comes with a great warranty. I'm able to grill 7 or 8 1/4 lb. burgers on it. Easy cleanup. The grill is the right size for singles, couples, and small families. The only disadvantage in my opinion is the gas hookup. This grill uses those small disposable propane tanks. I would rather have the ability to hook a larger tank to it. Rated 5 out of 5 by JBSJ Works well Received as Christmas gift. Great for small balcony. I can get grill to 600 degress F for searing steak and low setting stays around 400F when I grill chicken. Rated 5 out of 5 by Rickpr 2nd one This Q1200 is actually my second one. The first one lasted 13 years. I like how they made the cooking surface in 2 pieces now as it makes it easier for clean up. Rated 4 out of 5 by Ansel Good value Have used it a few times and it seems to work well. Will have better information in a month or so. Rated 5 out of 5 by DelrayDoll Small but Mighty This is our 4th or 5th Weber over the years! Replaced another brand working larger grill that we had to move whenever there's a hurricane so decided to get something smaller. This suits our needs perfectly. Large enough grill space, fold up side shelves, and I love my lavender lid! Separately, we actually purchased a copper grill sheet so we don't have to clean the grill every time. We did have to buy a piece to convert the tank to the grill (and a cover for inclement weather) as well as the stand (which needed an engineer to put together!). All in all, very pleased. Rated 5 out of 5 by Buddy E Great portable grill I received the Weber Q 1200 and the rolling cart as a gift and it is, without a doubt, the greatest tailgating grill available. It will be used extensively this summer on camping trips and I have used it at home for cookouts rather than my large grill because of the convenience. Rated 5 out of 5 by laurel easy to use i brought this to replace a very large charcoal weber grill and an very happy that I did. easy to clean and just the right size. Rated 5 out of 5 by diane46 Durable At this point, we have not used it yet as we just purchased the adapter hose for the propane tank and are in the process of having a cabinet built for it.